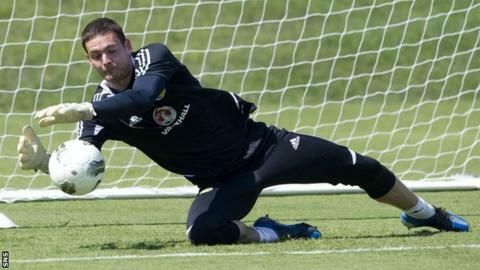 Motherwell manager Stuart McCall has admitted his possible interest in goalkeeper Craig Gordon. The 31-year-old, who has 40 Scotland caps, is fit again after two years on the sidelines through injury. He has been without a club since 2012. "I believe Craig is in at Rangers [for training] and looking fit and sharp," said McCall. "It's an interesting one, but all the goalkeeping dealings are down to [goalkeeping coach] Gordon Marshall." Gordon started his career at Hearts before moving to Sunderland in a £9m move in 2007. Injuries, including two broken arms, restricted his appearances during his five years with the English Premier League club. "I would imagine, if his fitness isn't in question, he will have far bigger clubs than us chasing him," explained McCall. "But there is no doubt, prior to his injuries, he was world class. "He is in at Rangers and, I know they have two good goalkeepers, and it would maybe be something they would look at. It would all depend, but we will wait and see. "I think it would be crazy to say you aren't interested in somebody. But, then again, we would be interested in Wayne Rooney if he popped up next week. "Nothing has been happening from our point of view." Third-place Motherwell trail Aberdeen only by goal difference in the Scottish Premiership ahead of the Steelmen's trip to St Mirren on Saturday. "We always have it tough when we go to Paisley," added McCall.